Now a presidential candidate, Bernie Sanders is arguing that the government should wind down several large financial institutions. Senator Bernie Sanders announced legislation Wednesday that would break up the country’s largest financial institutions. It’s the third time he’s introduced such a measure, but this time around he wields the large microphone of a presidential candidate. The bill, titled the “Too Big to Fail, Too Big to Exist Act,” will also be introduced in the House by Representatives Brad Sherman and Alan Grayson. If passed, it would require regulators at the Financial Stability Oversight Council to come up with a list of too-big-to-fail institutions whose failure would threaten the economy. One year later, those banks would be broken up by the secretary of the Treasury. Sure to be included on that list, based on the standards outlined in the legislation, would be JPMorgan Chase, Citigroup, Goldman Sachs, Bank of America, and Morgan Stanley. The theory, according to Sherman, is that with an assured government-led breakup on the horizon, the banks would divide themselves into smaller companies by themselves during that year so as to set their own terms for winding down. The bill would also prohibit banks on the list from using insured deposits for any kind of speculative activities or hedging. “The function of banking should be boring,” Sanders said during a press conference in the US Capitol. The prospects of this bill passing in a Republican-controlled Congress approach absolute zero. Sanders acknowledged that reality, but said the legislation presents a basic test for legislators. It also unavoidably poses a test for Hillary Clinton, the other declared Democratic candidate. Much of the Draft Warren movement launched by progressive activists focused on the Massachusetts senator’s advocacy for combating the financial sector’s power generally, and breaking up the big banks in particular—and Clinton’s perceived weakness on that front. Sanders swatted away questions about the presidential race, saying he was “not here to talk about Hillary Clinton.” But he did sideswipe Bill Clinton’s record on Wall Street at one point. “I was one of the leading opponents of Alan Greenspan, Robert Rubin, and Larry Summers, who all told us how wonderful it would be if we deregulated Wall Street back in the 1990s,” Sanders noted. Another likely Democratic candidate, former Maryland governor Martin O’Malley, wrote an op-ed in The Des Moines Register in March that also called for the biggest financial institutions to be broken up. Elsewhere, Senators Sherrod Brown and David Vitter have introduced similar legislation in the past, and the Federal Deposit Insurance Corporation’s Tom Hoenig also favors break-ups. 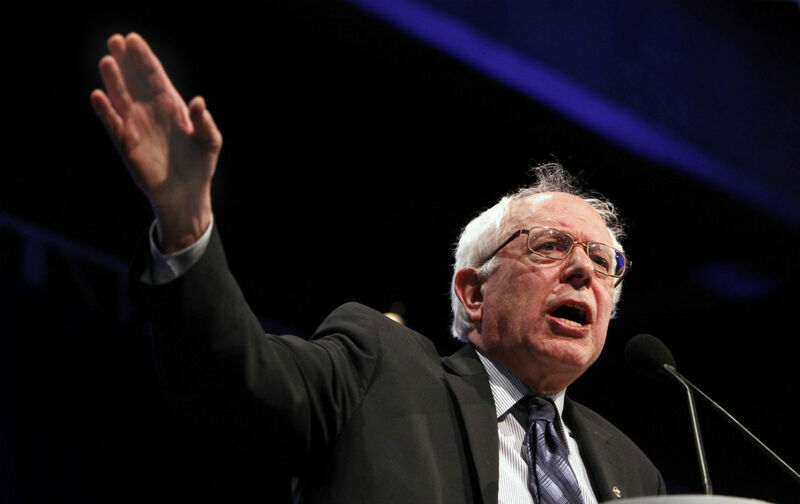 Sanders and Sherman cited the danger posed to the economy by big banks, many of which are dramatically larger than they were before the 2008 financial crisis. JPMorgan Chase, for example, has increased its assets by $1.1 trillion since 2007. The duo also described their belief that big Wall Street banks are crushing smaller and medium-sized banks. Sherman cited research from the International Monetary Fund that when big banks have implicit taxpayer backing, their access to capital is so much easier that it amounts to an extra $83 billion annually—something he argued was an unfair advantage over smaller banks that would be allowed to fail. The Independent Community Bankers of America, which represents 6,000 smaller banks, has endorsed the Sanders-Sherman legislation. Beyond just small banks, Sanders argued that enormous financial institutions harm the broader economy because those smaller banks are key sources of capital for small businesses. “Wall Street cannot be an island unto itself separate from the productive economy,” he said.